Who hasn’t avoided their responsibilities for the longest amount of time possible, and latter regretted the imperfect result of their last minute work? The same is true for undisciplined and last minute budget keeping. No amount of work on a budget will be better than consistent entries and regular upkeep and attention. Regularly entering data related to your financial matters into a spreadsheet is an easy habit and it is not time consuming. Nevertheless, there still is a probability of not following a regular pattern for budget entries. An undisciplined approach to budget keeping will yield missed entries, lower investment rates and smaller savings. If you can’t regularly write down date related to spending, you are bound to lose cheques or the track of your purchases. Failing to use discipline for budget keeping will result in lower investment rates. After all, it’s impossible to invest properly if you don’t know how much you are spending and how much you are saving. Also, if you don’t keep track of the gains and losses of your investments, you could invest in unprofitable investments. Lower investment rates coupled with unaccounted purchases will eventually lead to smaller savings. It is impossible to achieve large savings if you don’t know how much exactly you are spending and the yields of your investments. This Don’t is one of the main reasons why so many people fail at keeping a budget. This blog discussed how impulse purchases impact grocery shopping. To say it simply, impulse purchases are probably the main reason why it can be so hard to fit into a predetermined grocery budget. The same is true for a financial budget. Impulse purchases are acceptable from time to time. There’s no reason to worry if they don’t make up more than 5%-10% of your total budget. However, “mercy” for impulse purchases is a trap that can lead to your expenses growing more and more. Here’s how it works. You make an impulse purchase. Because you have a financial budget and impulse purchases don’t look good in it, you hesitate to enter the purchase in the spreadsheet. Of course, you eventually have to find a place to enter the amount of money spent by this purchase. You may want to justify the impulse purchase by putting it into a proper category. E.g. crisps that you weren’t going to buy into the groceries column. When you later look into the data of your spreadsheet, you will see that impulse purchases are very few far and in between. Why? That’s because by putting impulse purchases into inappropriate categories, they are “hidden” and given mercy. That’s how people end up being dissatisfied by their financial budgets and don’t see the need to keep them. It’s a mind trap that’s easy to fall into, but hard to get out. This is a very important Don’t of budget keeping. Wrongly sized categories hinder many people from achieving high savings. If you choose to use very large sub-categories for your financial budget, you won’t be able to analyse the smaller patterns of your spending. If you choose to use very small sub-categories, you will end up looking for trends where there might be none. I advise using sub-categories that are neither the largest, nor the smallest ones that you can choose. This way the financial budget will only show the largest patterns and trends in spending. Smaller trends and patterns can be valuable to see and interpret, but they often end up being created by our pattern-seeking minds, rather than by real changes in our spending. Budget keeping is impossible without preparing for and tracking unexpected expenses. Having dedicated categories both for savings for unexpected expenses and actual unexpected expenses will save budget keepers many worries and uncertainties. Preparing for unexpected expenses is one of the main advantages of having a budget. Clearly seeing the amount of money left at the end of the month and transferring it into savings for unexpected expenses will lead to a small nest egg for uncontrollable financial situations. Savings for unexpected expenses should be put at the top, and unexpected expenses should follow next. Others may advise to put unexpected expenses at the forefront. Doing so would help to see if there is enough forethought about the future spendings of a budget keeper. It follows the logic that earnings (in this case, savings) should be ahead of spending. That’s not only an easy way to calculate how much money you have left every month for unexpected expenses. It also enables the budget keeper to clearly see the differences (if there are any) of their savings and their spending on unexpected expenses. When people get into budgeting, they discover the power they have over their finances. That power is really nice, and putting more work into a budget starts being not a chore, but a pleasurable activity. Counting money and seeing it grow is one of the nicest feelings and budget keeping amply provides it. That’s why most people’s budgets will get complicated over time. That is expected, as people discover more and more techniques and methods of budget keeping as time goes on. Nonetheless, the saying “less is more” should also be followed in budget keeping. Complex formulas or obscure counting methods may be fun to play with in a spreadsheet. However, the numbers, and not the methods to manipulate them with, should be the focus of every budget keeper. So, DO simplify your budget if it requires extensive knowledge to use it and you see it taking up more and more of your time. The full potential of Excel (or Libre Office’s Calc or Open Office’s Calc) is only unlocked when the user takes full advantage of the formulas, pivot tables and programming the programme offers. DO learn how Excel works and what functions and shortcuts it offers for calculating and analysing data. Just using the basic formulas, such as SUM, MIN, MAX, will help you optimize and ease your work on your budget spreadsheet. If you have the time to learn Excel programming, then you will unlock the full power of this spreadsheet software. Also, many people know the basics of Excel, but very few are advanced users. By learning Excel programming you will not only optimize your spreadsheet, but will also learn a valuable skill. Taxes are inescapable as death. Or, it will be possible to upload your mind to a computer in the future, and escape death in that way. But, all forms of taxes will still exist, even if it will be possible to achieve certain immortality. A less important DO of budget keeping is to have a place for taxes in your budget. Therefore, your financial budget should have a section for taxes. That section can be replaced with additional taxes sub-sections in categories related to income or investment. The two ways to incorporate taxes in your spreadsheet are shown in the image below. Neither way to take care of taxes in your budget is better, but the first way (shown on the right) is suited for people who like to have a tight control on their finances. For more laid back budget keepers, a separate section dedicated to taxes will be the better choice. Investing money and saving money are two ways to improve your financial situation and grow your assets. Many budgeting spreadsheets place investments and savings close to one another, as those two categories have similarities between them. I advise to Don’t place or worse, mix, investments and savings in the same categories. That’s because they have more differences than similarities as assets, and mixing them could lead to a critical mistake. Investments require a long-term outlook, weekly if not daily check ups, knowledge about taxes and enough income to afford them. Savings, on the other hand, require a short-term outlook, monthly check ups, little to none additional knowledge, and minimal income to save. If a budget keeper treats savings and investment as assets of similar worth, they will either invest unprofitably, or will give too much importance to an asset that does not generate growth on its own (savings). Overall, it’s best to keep sections related to savings and investments as far as possible. 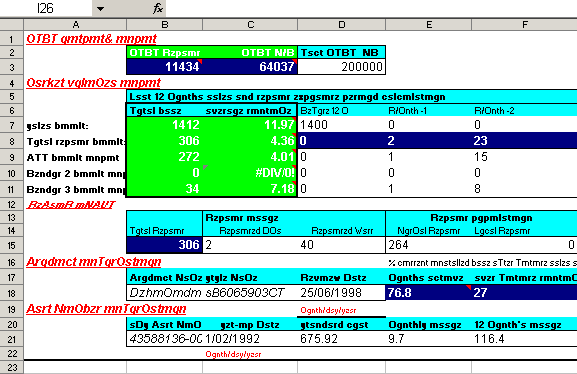 #9: A PhD to analyse this spreadsheet? This Don’t is self-explanatory. A complicated spreadsheet with huge amounts of formatting, inconsistent formatting and unclear categories will hinder the ability to analyse and keep a budget. It’s expected that a personal financial budget will reflect the needs and tastes of the particular budget keeper. However, too much customization will distract from the things that really matter when keeping a budget. And those things are the numbers and percentages. Not coloured cells, and certainly not three degrees of formatting on a category name (as seen in the image above). Nonetheless, formatting is a must for large budgets (big families or complicated spending patterns). A budget keeper won’t be able to keep track of their budget, if all of the categories look the same. Also, if there is no clear distinction between income, spending, savings and investments. The image below shows an overly simple spreadsheet which is the right fit for a business enterprise, but isn’t for a personal budget. Notice how there aren’t clear distinctions between different categories and how little formatting the text has. It would be very easy to mistake one sub-category for another if a personal budget was formatted as simplistically as the one below is. It’s very easy to fall into a routine for budget keeping. First, even small improvements of your financial situation will seem like great victories. When time goes on, even large savings or a great track record of budget keeping will seem ordinary. Budget keeping will start to feel like another mundane thing you have to do to succeed in life or to improve it. This type of thinking will eventually lead to a negative outlook for the future. When victories aren’t celebrated, they start to seem distant and not worth it. If you don’t acknowledge your financial improvements, you will likely take on a more negative outlook for the future. For investing, a negative outlook for the future may work in the short term, but it will harm the investor in the long term. Economies go through booms and busts, and losing out on the boom will mean that the investor won’t be prepared for the bust. Low volatility and low growth investments are great for the mental health of the investor, as they don’t give neither too much excitement, nor too many worries. However, “safe” investments get quickly wiped out in an economic downturn and still aren’t protected against the irrationality of other investors. Therefore, DO celebrate small victories. They are the key to a positive outlook on your financial future.